We thank you for your support and look forward to 2006. We wish everyone the best for a safe and festive holiday season - and please continue to check back for updates on our trips as well as the web site enhancements. Not really much to report at all. The colder weather has had us hunkered down, but a brief warm-up this coming weekend might get us out on the water. Who knows maybe some heat - yea right - will stimulate some action by the fish. Reports have been few and far between as the holiday season has set in and all are running around. The only advice I can offer is - stay away from the malls!!!!! Be safe. Please send in comments to the Corps about next year's release plan from Francis E Walter. The more the merrier!! Once again we will be heavily involved with what is going on - at least as much as we can. Email us if you want to get involved. We are now booking for 2006! 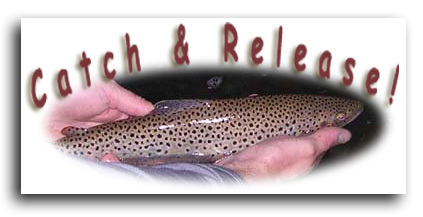 Be sure to reserve prime spring dates NOW as we have already had inquires - primarily Lehigh River floats. Please note that along with our wade and float trips we will also be doing a complete slate of package trips - much like previous years. Don't miss out on these opportunities. Look for us to annouce the dates for these after the first of the year. Much like you, we look forward to another year of being on the water as you never know what Mother Nature will throw at you. 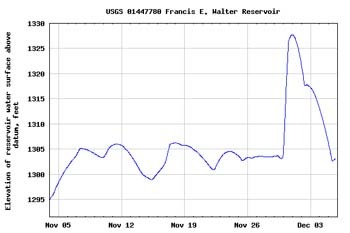 On top of this we will be intimately involved with the ongoing Lehigh River management plan - which should only make this river better. .
Francis E Walter goes up and then it comes down. This most recent spike utilized about 2% of flood storage. The dam fulfilled its mission. We've got the whole state and then some covered on this update. The Erie tribs turned into a bust. Wicked cold and flat-out brutal to be on the water - temps Thanksgiving day did not hit the high teens, the snow was sideways and the streams turned to slush. There was no one on the water, and there were fish to be had, but getting the fly into the strike zone was impossible. 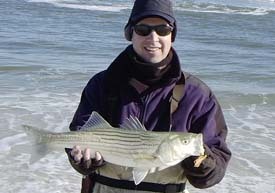 No doubt that if the weather would have been more conducive, the fishing might have been pretty good. The fish are definitely concentrated in the 'better' holding water. And we all know that this can be tough to fine when the water is low. No doubt once there is a melt and runoff the fish will be amped and provide some nice action. Like all migratory fish, timing is everything!!. Rt. 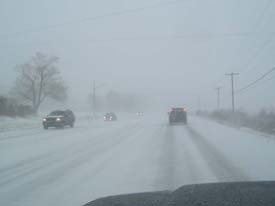 20 eastbound near Girard. Dean with one of his schoolie bass. Jim with his first ever salty bass! Nice going Jim!!! As Jim knows you have to put in your time! 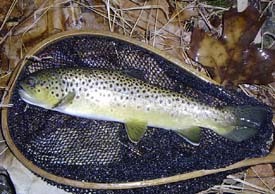 Central PA was cold, but did give up some fish. All trout - about 4 total - weakly hit a wired stone. Targeted water included the deep runs and the slower pools. There was no surface activity at all...and quite a few fish were observed along the banks. 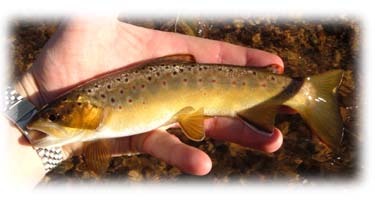 It was nice to see some fish after the hard summer that plagued this stream. Bring on next spring!!! A solid Penns brown. This is one of the '03 fingerlings. There is no adipose fin and they all look alike! The consistency of inconsistent salt action is a thing of the past right now along the salt. 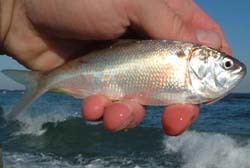 There has been a pretty steady pick of schoolie bass along the beachfront for a few weeks now. Even with the dirtier water and not much if any bait showing - the fish are around. My type of fishing when you have to log the miles to get to the beachfront! On Friday with the bite happening Dean had out Jim - who wanted to try his luck again in the suds. This time the fish cooperated. According the Dean you had to work for your fish. Once again, you cannot catch fish if you are hanging out by your truck! You have to have your fly or lure in the water. Sounds pretty simple, eh! 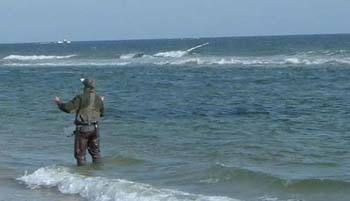 This time of year, even if you see fish a considerable distance off the beach, but nothing in tight - no matter what - continue to throw! Chances are there are rouge fish roaming the trough. And sometimes this is where the big fish can be found. The scavengers! Hang in there; the salt is still going strong! Photo op! Notice the fly caster friendly conditions created by the slight NW breeze. Finally some fish have made there way into to the surf zone. Both blues and bass. We got into them pretty good in the am hours - actually out fishing the spin guys! ha! The key was to find the bait and just throw!. There was not a lot and most everything was just off shore over the outer bar, but the thing is - everyhing can't be over the bar. hint hint. 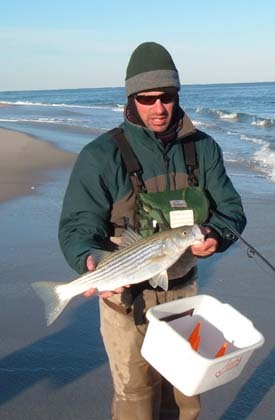 If you see boats just offshore - look around, chances are there is some bait in close....with a few fish on it. That was the case this morning. And as long as you got the fly to the fish - they ate it. Flies did not matter - deceivers, jiggies and clousers all produced fish. Best color was white. It will be interesting to see what is going to happen with the artic air moving in this week. For all I know the run is just beginning! Hopefully it continues. Please take note...reports are going to be suspended for the coming week due to traveling for the holiday. And if all goes well, there will be a fishing report to log upon return. One half of FFPA plans to hit the salt, and the other half hopes to hit the Erie tribs. In the past the tribs have produced quite well around Thanksgiving. Check out this report from a few years ago...hopefully the action will repeat itself. You can be sure that the fly of choice has already been picked out! 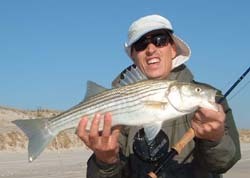 This past weekend we ran a salt trip for TCO Fly Shop. We had out Bob and Jim and unfortunately the fish did not cooperate with us, which seems to be about par for the course so far this year for us shore bound anglers. With the lack of fish we concentrated on reading the water, casting, bait id, retreive techniques and gear selection. I think we saw a total of 4 fish landed the whole time - and they came on bunker heads and clams. It was a dead sea, except for one lonely pod of peanut bunker. Things can only get better. The dark spot pictured above is a pod of bait - but no predators were to be found. Here we are in November and we've yet to hit the salt action we've come to expect by this time of year! It is only a matter of time. To date it has been very slow - with the fish showing on only a few days. On the fresh water scene....be aware that the brownies are spawning or are about to begin. Just the other day on Valley I came across some brite gravel areas that I think are spawning beds. On one of them I'm pretty sure I spooked the female off of it. The bed was at the back end of a pool - the tail and as she swam away - all I could see was the wake...the glare was bad - so I could not see the fish - just the wake - which was significant. The immediate upstream main pool is big and deep! She mighta been a pig? Be careful out there. Get out and enjoy this weather!! A nicely colored VC brownie shinning brite in the November sun.